I headed up to San Francisco with my blogger gal pals to see a Staples Security Seminar titled "Help Safeguard Your Life" with NBC Today Show and Dateline NBC personal security expert Wild Bill Stanton. 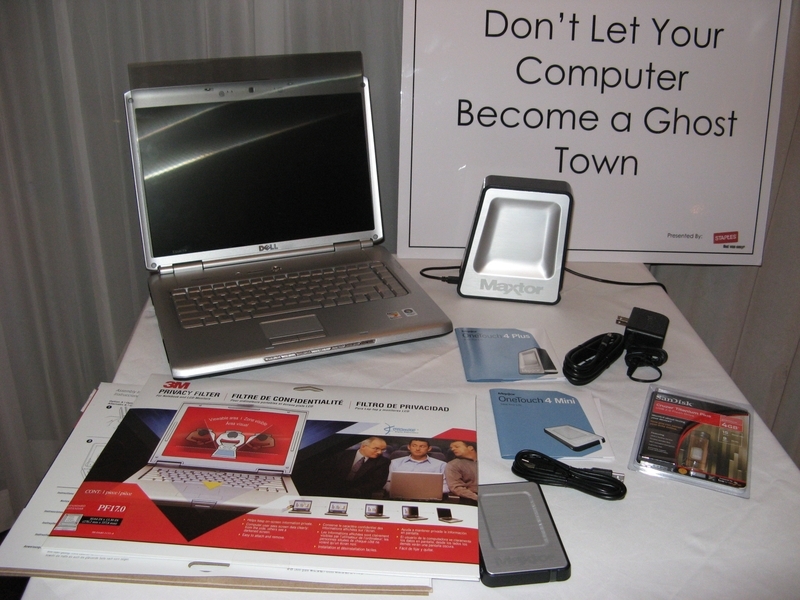 Staples’ press release dated Feb. 13 2008 explained their effort to Identify top at-risk behaviors for security threats, and relates to their Security by Staples initiative. Their security center has information on shredders, software, digital storage and a learning center with security related articles including child and teen internet safety. Bill of course). On the far right side we were so happy to meet Cat! Utilizing his background as a New York City Police Officer, Bill Stanton shared his perspective on personal security with us including hotel, car, home,and children. He started out by saying "Analyze Risk , don’t be paranoid – be prepared. Be proactive – don’t become a victim". loss, which goes up to appr. $1200 if the their sets up a new account. hundred of thousand of names. while talking on a cellphone – you never know who is listening. of personal documents. Some of the shredders can even handle CDs/DVDs and credit cards. added to the discussion that locking laptops at home is a good idea. Another attendee mentioned the issue of laptops being stolen at cafe’s while the owner walked up to get their coffee. With a room full of bloggers/online writers the thought of computer crashing was a sore spot. We discussed that data loss was a big issue. Along with data files, digital photos are important to consider when backing up. We discussed using using hard drives, portable drives or USB drives for backing up. For those running a business, a data protection policy that includes a back-up policy should be put in place. The top internet security threats include hackers, viruses, spyware and phishing scams. We discussed that it is important for all computers to have internet security software – not only installed – but regularly and automatically updated. Vendor websites should be checked for upgrades, patches and security advisories. 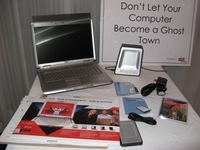 The internet security software modules should stay active while the computer is running to immediately detect intrusions. 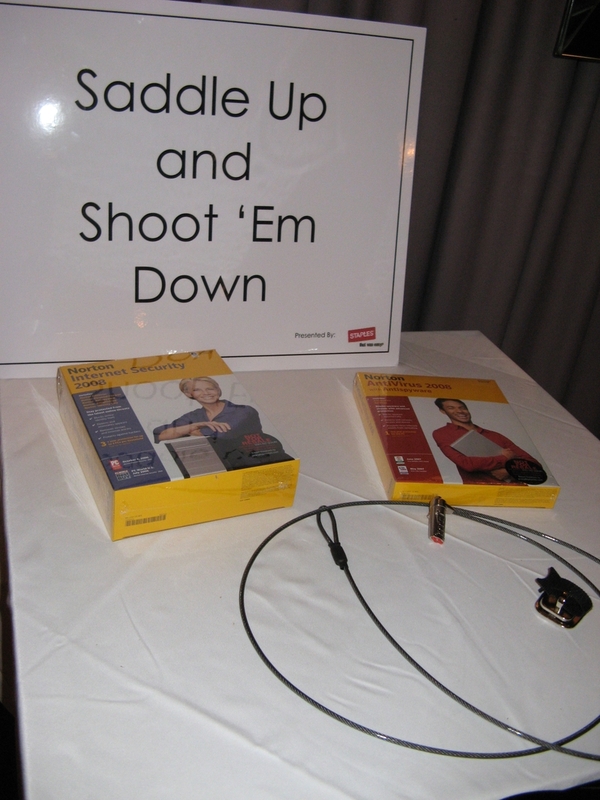 This table had the DEFCON CL combo cable combination lock, Norton Internet Security 2008 and Norton Anti-virus 2008. The shredder shown above is the Staples MailMate M3 Shredder. 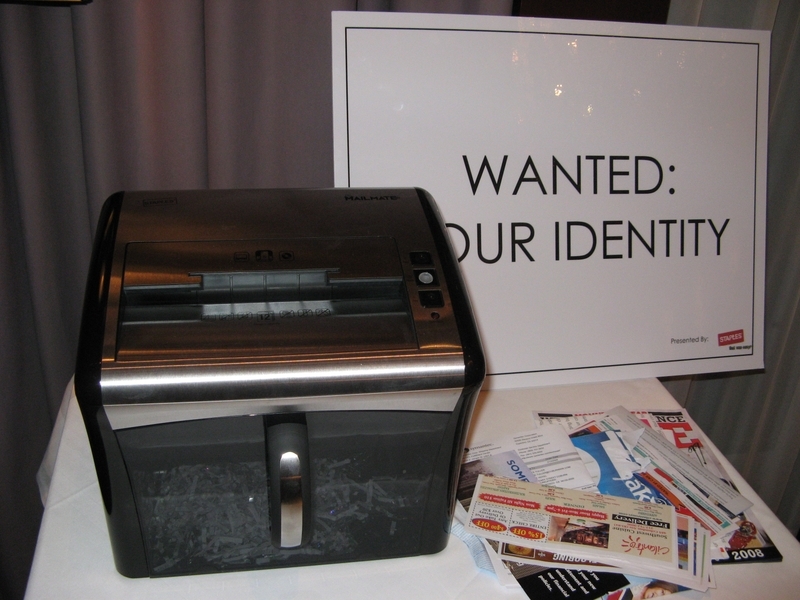 Some of the unique qualities of this shredder is that it can shred CD’s/DVD’s and credit cards as well as paper or junk mail. The cut is a "cross cut" for greater security. This table had a LCD privacy protector for protecting data on the screen while working in public places. Along with the Maxtor 250GB One Touch 4 Plus External Hard Drive and the Maxtor 120 GB OneTouch 4 Mini Hard drive for back-ups.